This beautiful oceanfront cottage overlooking Higgins Beach is located on the 400 acre Sprague Family property founded in 1920 by Phineas Warren Sprague, who made his money in coal and oil. The land remains in the Sprague family for preservation purposes and to benefit the family. With miles of carriage and walking trails as well as 2 beaches, a horse farm, and incredible views, there is much to explore on the parts of the property open to guests. All of the various homes on the property are still owned by Phineas' descendants, and most are used as summer vacation homes. The houses are all separated by considerable distance, so privacy is easily obtainable. Just a short 15 minute drive from the bustling city of Portland, you will find yourself winding down a road surrounded by fields and instantly feel at peace. Arriving at this nicely updated beach cottage, you'll be hard pressed to not sit on the deck and watch the surfers over at Higgins Beach, or head out on your bike or by foot to see some of the picturesque private beaches on the property after exploring the carriage trails. This classic Maine cottage has the feeling of summers past with the comfort of today's standards. In addition to a deck that overlooks the bay, entering the cottage, you'll find a living room and dining area that share the same spectacular view. This property is a perfect destination for those looking to get away. It is also a great property for biking, walking, and swimming or for card games at night and family/friend intimacy after long fun days in the sun and at the beach. However,if you want to experience Maine's largest city, you can be down in the Old Port of Portland shopping, dining, or bar hopping within 15 minutes. BEACH CLASSIFICATION: We have categorized this property as having or being near a sandy beach. 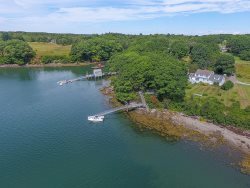 More specifically for this property - there is a sandy beach in a river outlet a 3 minute walk away, and another amazing beach about a 10 minute walk or just a 2 minute drive away. There is not an actual usable sandy beach directly in front of the cottage, but the nearby beaches are great for kids and that is why we have classified it as being on or in this case - "near" a sandy beach. Easy to work with and very professional. This was a family week for us...and the first time in Cape Elizabeth. Three generations of us used this cottage and had SO MUCH FUN! The property is very unique and the views are amazing. It is a Maine cottage in every sense of the word...simple, rustic and well loved. We had wonderful weather which made a big difference when you are in this remote spot. The access to the beaches and the water allowed for all sorts of activities. Once we got the lay of the land, every aspect of the property was an adventure. Portland isn't too far away and some of the family went into town in the evening. The turkeys and deer entertained us all! On the Water in Maine is very easy to work with...very kind and considerate! 3rd year in a row at Blueberry Hill Cottage and it gets better every year! We absolutely love the cottage and the view is amazing. The redone deck is a wonderful feature and perfect place to relax. Super easy to work with agency. Immediatly responsive to any questions or concerns. As always - it was easy and wonderful. This property had some of the most stunning views - meals and reading on the porch were just magical while watching the tides come in and out on Highins Beach. Just wonderful. And that's not even mentioning the grounds and Strawberry Beach - a private and beautiful place. Magic. On the Water is great to deal with. We had a couple of special requests that were accommodated without a problem. The Blueberry Hill Cottage was perfect! Close to everything but very secluded as well. The views and beaches made us not want to ever leave the property. Wonderful house. View of Higgins beach so soothing. Ocean beach just two miles away and completely suitable for little children. House was immaculate , filled with light, and very well provisioned. Easy access to farm stands and fresh lobsters. Loved the old fashion Maine feeling to the house. The agency was easy to work with and very responsive. Loved the home itself. It is old but quintessential New England. It was very roomy for a family of 8 never feeling crowded. The location is a beautiful, private and the property owners are very respectful of your privacy. I would love to some day return to Blueberry Cottage. Wonderful! Very responsive and friendly. If I was lucky enough to live in Maine, I'd be friendly all the time, too!! The entire cottage was my favorite feature, soooo homey and quaint and welcoming! Spacious! Love the deck, the huge kitchen, huge washer/dryers...but best of all, the view from the main room and all of the windows looking out to the ocean and lush green yard...Just perfect. I haven't been that relaxed in YEARS. On the Water in Maine is organized and attentive and very easy to work with. We had a great experience and it was very personal. We'd love to rent from them again. The cottage was more than we expected! The pictures don't do it justice. It was an absolutely amazing property, beach, view, and trip! We'll definitely be back! Our favorite features were watching the tides come and go, and great sunsets. Interior decor tasteful, colorful, bright, old-fashioned. Landlord/owner accessible, helpful, responsive, modest.